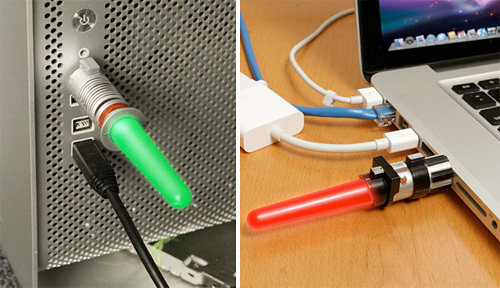 Lightsaber Flash Drives | OhGizmo! They’re only 1GB in size, which is not a lot of storage for $19.99 these days, but something tells me ThinkGeek is going to sell millions of these Japanese Lightsaber USB flash drives. They’re officially licensed Lucasfilm collectibles, and they’re available in either a glowing red Darth Vader model, or a glowing green Luke Skywalker one, but I’m going to assume you’re not even reading this post anymore and are already in the process of placing your order at ThinkGeek. I have a 4gb smaller than half of the lightsaber's hilt. They could have this one as 64gb. I hate to say it, but those just look like little vibrators to me. They're not 1:1 scale. I don't see the wow about it. Don't get me wrong I love thinkgeek a lot. But it's just a nubby glow thing.